Well ... we're obsessed. 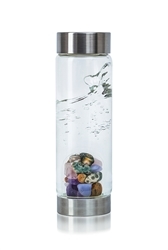 Vitajuwel are the new amazing gem infused water bottles . People have been using gems to infuse their drinking water for thousands of years. This amazing company is helping everyone of us change our drinking water with the developed tradition called "crystal healing". VitaJuwel has rediscovered this tradition and created glass vials that contain different blends of crystals, following tested and tried "recipes". VitaJuwel is the only way to inspirit water naturally and revitalize it with its original quality like fresh from the spring. Each of our VitaJuwel gem vials is handcrafted by master glassblowers in Bohemia. They use premium, lead-free glass and hand-selected gems. The process of heating, melting and cooling of a single vial takes about 24 minutes and is patented worldwide! All of our gems are fairly-traded. Before used in our gem vials, they are cleaned thoroughly in a special, 8-step process. 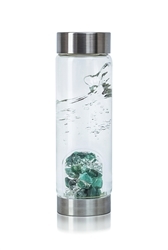 The special liquid inside the gem vial prevents the crystals from getting mossy and the vial from getting dim. It's natural and harmless. 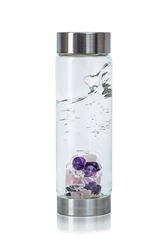 Preparing gemwater with a VitaJuwel gem vial is easy: Simply place your gem vial inside a pitcher (preferably made of glass), fill it up with regular drinking water and wait for 7 - 10 minutes. That's all it takes! You can either leave the gem vial inside the pitcher or take it out. The best part about these amazing water bottles is they start at $78 and make amazing gifts.